L'Assiette du Marché, Vieux Lille, 61 rue de la Monnaie (03.20.06.83.61/www.assiettedumarche.com). Open noon-2.30pm, 7-10.30pm Mon-Thur; noon-2.30pm, 7-11pm Fri, Sat. €€. Set at the rear of a cobbled courtyard, the historic former city mint provides a stylish setting for an evening out, with its high ceilings, fireplaces, well-spaced tables and civilised service. Cuisine puts a modern spin on classic dishes from all over France and the market-inspired weekly changing menu is a bargain, although success means that cooking sometimes falls down on precision when the kitchen is stretched. Tables outside in summer. La Cave aux Fioles, Vieux Lille, 39 rue de Gand (03.20.55.18.43/www.lacaveauxfioles.com). Open noon-2pm, 7.30-10pm Mon-Sat. €€€. This cosy, dimly lit old-town address, set in a series of small rooms furnished with antiques, is the perfect spot for a romantic dinner. Traditional bistro favourites include a good steak, skate with capers, and duck confit, and the wine list is excellent. 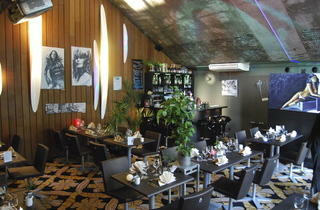 La Chicorée, Vieux Lille, 15 pl Rihour (03.20.54.81.52/www.chicoree.restaurantsdelille.com). Open 10am-6am daily. €€. The scarlet-coloured Chicorée is a well-known standby for night owls with food served till dawn, but its huge, heated pavement terrace also fills up fast as soon as the sun is out. Brasserie and regional standards are decently prepared, including oysters, mussels, steaks and carbonnade, although service can be slow when the place is busy. Prices rise by 20 per cent after midnight. Le Colysée, Greater Lille, 201 av du Colisée, Lambersart (03.20.45.90.00/www.le-colysee.com). Open noon-2pm Mon; noon-2pm, 8-10pm Tue-Thur; noon-2pm, 8-11pm Fri; 8-11pm Sat. Closed mid-end Aug & 1wk Jan. €€€. Young chef Benjamin Bajeux is one of the bright young talents of northern cuisine, drawing the occasional celeb among the well-dressed locals, and he conveys his enthusiasm with a genuine welcome. After working for Alain Ducasse in New York and Monaco, he returned home to take over this restaurant on the ground floor of the Colysée Maison Folie. Distressed concrete, bronze leather and modern art provide a suitable background for Bajeux's light, modern dishes, such as foie gras with apple chutney, scrambled egg in a crab emulsion or pork fillet cooked in beer. Desserts include a fabulous chocolate mousse layered with crispy caramel and fizzy sugar. 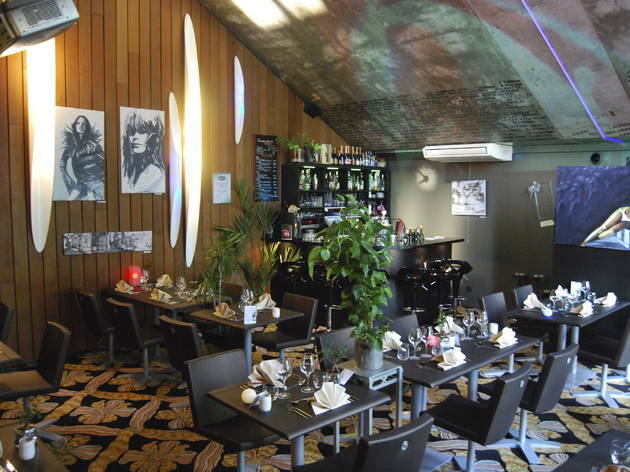 Estaminet Chez la Vieille, Vieux Lille, 60 rue de Gand (03.28.36.40.06). Open noon-2.30pm, 7.30-10.30pm Tue-Sat. €€. Chez la Vieille is a thriving example of the estaminet revival with a setting that is almost too good to be true: exposed bricks, tightly packed tables, a collection of old advertising plaques and prints, bar games and miscellaneous bric-abrac. Hearty traditional regional specialities include leek tart, chicken with maroilles cheese, and even chicory- and beetroot-flavoured ice-creams, preferably accompanied by one of the wide choice of beers. A la Huitrière, Vieux Lille, 3 rue des Chats Bossus (03.20.55.43.41/www.huitriere.fr). Open noon-2pm, 7-9.30pm Mon-Sat; noon-2pm Sun. Closed Aug. €€€€. Lille's luxury gastronomic treat occupies a dressy dining room above a gorgeous art deco fishmonger and deli, run by the same family since the 1930s. Although there are meat options, the emphasis is on the fish delivered daily downstairs. Think lobster, langoustines in foie gras sauce, turbot, sole and decorative desserts, prepared by a brigade of chefs. In 2008 a more casual oyster bar opened inside the downstairs fishmonger. Aux Moules, Vieux Lille, 34 rue de Béthune (03.20.57.12.46/www.auxmoules.com). Open noon-3.30pm, 6.30-11pm Mon-Sat; noon-3.30pm Sun. €€. The name leaves no doubt as to the speciality at this popular 1930s brasserie, nor do the cheerful tiled scenes depicting mussel fishermen around the walls, so opt for a casserole of moules marinières served with delicious chips. This place is always one of the contenders for the mussel shell award at the Grande Braderie.